Nate Montana's attempt to follow his father's footsteps at Notre Dame failed miserably. Montana’s terse comment evolved from the way his son Nate Montana was treated during his brief stint at Notre Dame. The younger Montana, who was a preferred walk-on, was a seldom used back-up who was sort of a renaissance man early in his career. In 2008, he saw no playing time as a freshman. In 2009, he transferred to Pasadena Community College where he completed 31 of 88 passes for 324 yards (2 TDs, 5 INTs). 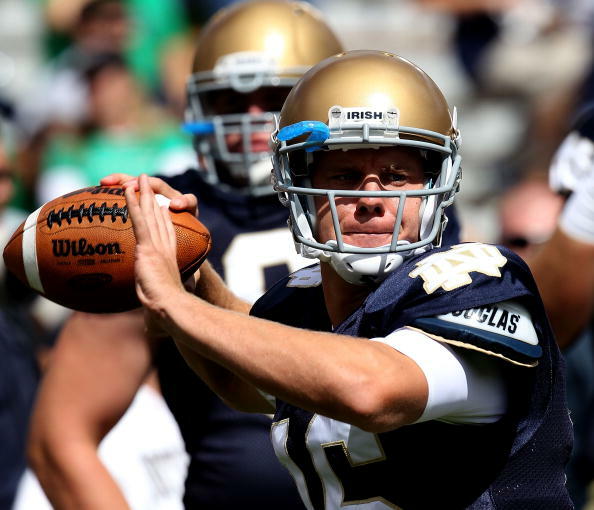 In 2010, he returned to Notre Dame as Dayne Christ’s back-up where is saw very limited action. When he did play, it was hardly stellar—amassing 116 yards in 3 games with 0 TDs and 1 INT. It’s clear Montana is bitter at his son’s treatment. But to be fair, Nate did not perform well on the field and he was not good enough to lead Notre Dame. While it’s understandable Joe the father is upset, Joe the competitve QB should understand. Nate Montana is currently a QB at the University of Montana.